On Saturday, Gramercy Neighborhood Associates held its sixth annual Taste of Gramercy Neighborhood food festival, this time selling out all of its available tickets. The annual event is a fundraiser with proceeds going to two local schools, PS 40 and School of the Future. This year, 23 restaurants, some new to the community, offered tasting of popular dishes on their menus, with additional food businesses as sponsors. Alan Krevis, president of the Gramercy Neighborhood Associates, didn’t say how much the event raised, but ticket prices ranged from $30-$80. Ticket sales were capped at 400 to make sure the participating restaurants would have enough food. Unserved portions of food were brought to the homeless via the Bowery Mission. On the afternoon of Saturday, September 16, Taste of Gramercy Neighborhood, an annual food festival and fundraiser, was held at Irving Place between 17th and 18th Streets. Food stands lined the block, with restaurateurs ladling out tastings under an open, sunny sky. Over 20 restaurants participated this year including 5 Napkin Burger, Laut, Beecher’s Handmade Cheese, BLT Prime, Trattoria Il Mulino, Burger & Lobster, Casa Neta, Chawlas 2 and Farmer & The Fish. 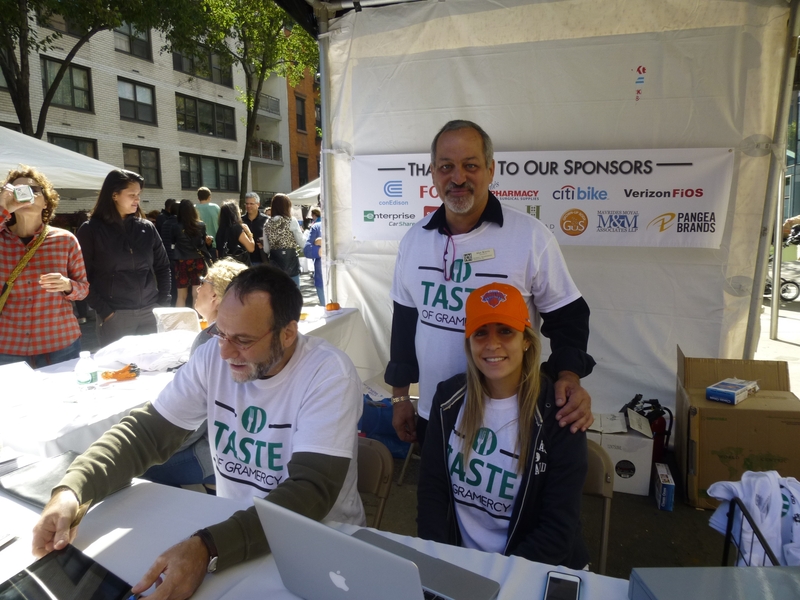 Taste of Gramercy Neighborhood, an annual street food fair/fundraiser held by the Gramercy Neighborhood Associates, will be celebrating its fifth event on Saturday, September 16. Around 20 restaurants from the neighborhood will be involved, offering tasting of signature dishes, under an open sky. The event, as always, takes place along one block, Irving Place between 17th and 18th Streets, from noon-4 p.m. The money raised from the event goes to two local schools, School of the Future and PS 40. Alan Krevis, president of GNA, said the event has grown each year in terms of how many tickets get sold, with mostly local people attending as well as some visiting from out of town. Supporting neighborhood organizations is about to get very tasty. This is because three local organizations are holding food tasting events this month bypassing more traditional kinds of fundraising events. The hosts are, respectively, the Union Square Partnership, hosting the 21st annual Harvest in the Square festival on September 22, Gramercy Neighborhood Associates, holding the fourth annual Taste of Gramercy Neighborhood on September 24, and Solar One, holding an Oktoberfest event on September 27. Harvest in the Square benefits its host’s efforts to maintain and beautify Union Square Park as well as fund summer programming. Over 50 local restaurants will participate at this event, held under a giant tent at the park’s North Plaza. A handful of those include Croque Monsieur, Gramercy Tavern, Ngam, Rosa Mexicano, Strip House, Flats Fix, Black Barn, The Pavilion, The Poke Spot, Union Fare and Hill Country Chicken. There will also be tastings from a dozen regional wineries. On Saturday, Taste of Gramercy Neighborhood, the annual food tasting festival and fundraiser, took place under a sunny sky on Irving Place. This year, 20 restaurants participated and the event’s organizer, the Gramercy Neighborhood Associates, sold 325 tickets. GNA President Alan Krevis said it was the best year so far — this was the third time the event was held — though he declined to share how much money the event raised. Net proceeds will be going to two neighborhood schools, PS 40 and School of the Future. Meanwhile, the crowd of mostly neighborhood residents sampled dishes like rabbit meatball sliders from Ichabod’s, lobster rolls from Burger & Lobster, house cured Tasmanian sea trout from Barbounia and yellow tomato gazpacho from Adalya. At the event was Claude and Shelley Winfield, residents of East Midtown Plaza, who said they’re regulars at many Gramercy restaurants, like Ponty Bistro and Casa Mono, and always on the lookout for new ones to try. “Shelley and I try to support the neighborhood restaurants, otherwise you lose them,” said Claude, also the second vice chair of Community Board 6. At TOGN for the first time was another couple who live in a building on the block where the event was taking place, between 17th and 18th Streets. After sitting down at one of the streetside tables, both Liz and Mark Mindlin said they were impressed with all the options. “The food is delicious so far,” said Liz, who added that while they often go to restaurants in the neighborhood, the event was the first time they’d heard of The Stand, a nearby comedy club and restaurant. “The food was very good,” she added. A few of this year’s participating eateries also said the festival has been helpful in getting the word out about their businesses. A returning restaurant was Ichabod’s, where Courtney Oakley, the director of events, said the event sometimes attracts foodies visiting from out of town (the W Hotel is nearby) as well as people from other neighborhoods. On Saturday, Gramercy residents and foodies got to sample dishes from over 20 local restaurants, which were all participating in the second Taste of Gramercy Neighborhood event. The outdoor food tasting event and fundraiser for the Gramercy Neighborhood Associates took place along one block on Irving Place with plenty of foot traffic despite some rain later on. Tickets ranged from $30-$80 in price with the proceeds going to two local schools: PS 40 and School of the Future. Terry Dougherty, a longtime Gramercy resident, was one of those who’d gotten a ticket. Another guest was Larry Oberfeld, who lives on the Upper East Side. 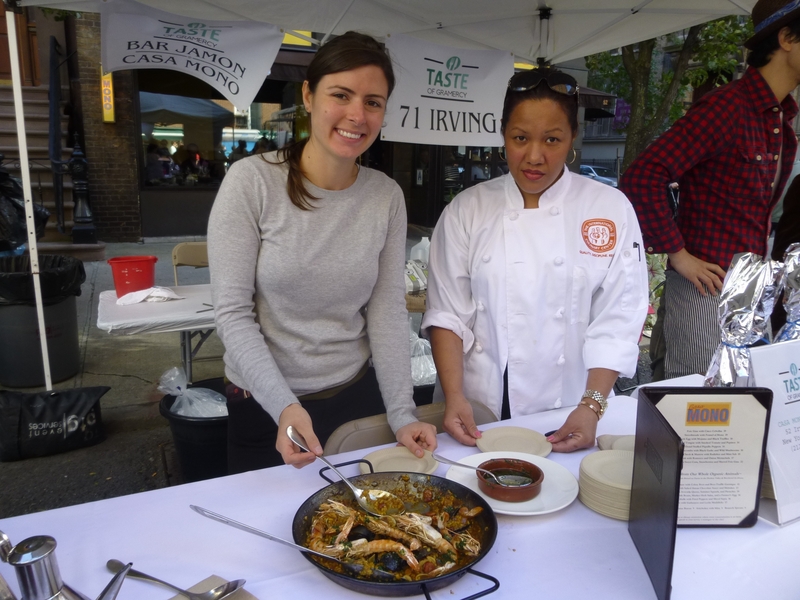 Taste of Gramercy Neighborhood, a food festival and fundraiser that debuted last year by the Gramercy Neighborhood Associates (GNA), will soon return for a second helping on Irving Place. The event, which was attended by over 400 people last year and had 20 restaurants participating, will be held this year on Saturday, September 13 from 11 a.m.-3 p.m. This time, there are 22 restaurants that will be offering tastings of their signature dishes, including the new Indian restaurant A Spice Lane and Almayass, a Lebanese restaurant. Also involved for the first time is Farm to Me, an organization that distributes farm products to retailers and consumers. The name, too, is new. Originally, the event was just called Taste of Gramercy. Like last year, Taste will take up one block, Irving Place between 17th and 18th Streets. How much the event costs depends on how much attendees want to eat. A $30 ticket will buy tastings from six booths. (This is the early bird price through August, though. Tickets go up to $40 in September and $50 on the day of. An $80 ticket on the day of the event entitles an attendee to have a tasting from every restaurant. Proceeds from the event will then go towards expanding the healthy lunch options at two neighborhood schools: PS40 and School of the Future. Any unserved food will be brought to the Bowery Mission. The tasting menus have not yet been decided on by the participants, but last year popular dishes included the meatballs, gnocci and eggplant rollatini from Paul & Jimmy’s, tuna tartare cannoli from The Stand and shrimp paella from Casa Mono, all of whom are returning in September. A few other participants are Ichabod’s, Giorgio’s of Gramercy, Ainsworth Park, Jack’s Sliders and Sushi and ExKI NYC. Water will be provided by sponsors Watermelon Water, Fogo and Trader Joe’s and coffee will flow at the 71 Irving stand. What there won’t be are alcoholic beverages, with GNA board member Ellaine Day explaining the permits were just too difficult to get. As a result, another fall event the GNA is known for putting on each year, the Canine Comedy Parade, has been put on hiatus. “It needed a rest,” said Krevis. Instead, the GNA will be organizing an event with Baruch High School and College in October. For tickets to Taste of Gramercy Neighborhood, visit gnaonline.org.